Paisley has been voted the best town in the UK & Ireland in recognition for its ‘outstanding’ efforts to transform its fortunes. It took the ‘Great Town’ award at the Academy of Urbanism awards ceremony in London, beating off competition from shortlisted Barnsley in Yorkshire and Chelmsford in Essex. Paisley is the first Scottish place to win the title since the inaugural awards in 2006. Voted on by Academy members, five awards are given out annually, including for Europe’s best city, and places are judged against a number of social, economic and environmental factors, including good governance and commercial success. The Great Town award recognises the best, most enduring or most improved urban environments across the UK, Ireland and Europe, and this year focused on places that have been through transformation. As part of the judging process, assessors visited Paisley in August and lead assessor, Michele Grant commended Paisley for using heritage and culture to change the narrative of the town. Renfrewshire Council’s investment in social housing was also praised as ‘impressive’, as was the ‘deep and meaningful working between the Council and communities’. 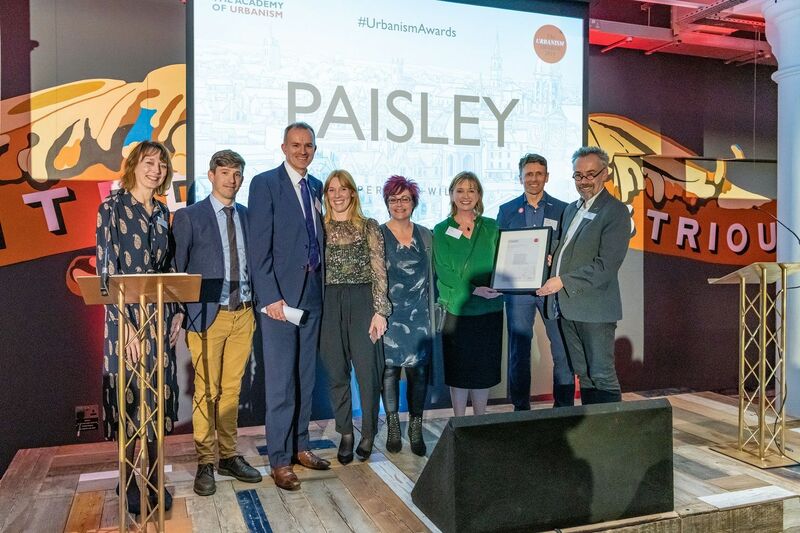 Renfrewshire Council Leader Iain Nicolson said: “We are delighted that Paisley has been awarded the Great Town title – something that couldn’t have happened without the tremendous support from all sections of the community. “The bidding process for UK City of Culture 2021 kickstarted the process to transform our place, which is very much continuing with our plans to use Paisley’s unique cultural and heritage assets to make it a key destination for visitors and events. “Work to revitalise our town centre and economy is already underway, with a £110 million investment in the town centre and our venues, and £276 million of major infrastructure projects taking place in Renfrewshire as part of the Glasgow Region City Deal over the next decade. David Rudlin, Chair of the Academy of Urbanism, said: “Home of the Paisley pattern – a town that has recovered from industrial decline by concentrating on the basics, good housing, affordable housing and has a strong town centre. Sharon McAulay from the town’s Star Project said: “One year on from our City of Culture bid, it’s a timely reminder that Paisley is a vibrant and beautiful cultural destination and is being recognised as such from far afield.